I want to play around with the concept of effort this week. If you’ll excuse the indulgence, I feel the need to fade into a nostalgic anecdote, my primary school report cards back in the (sob) 1970’s used to show grades I had achieved in each subject area and right next to them with equal billing and status were grades for effort. For its time the system appears to have satisfied all concerned. Teachers gave their judgment and families understood what was implied. I think it was my grade 3 where I was really keen to impress mum and dad with my Maths but struggled with the perils of long division. When it finally came the report paired a B achievement with an A effort. With a physics teaching dad looking on, it was nice to show him that I was persisting manfully with something that I can’t say came naturally. No, indeed they don’t. And probably, with some justification too. The modern day report card is a sleek, finely tuned machine that is crafted to maximize feedback while minimizing potential insult. While I’ve not bothered to track the evolution of report cards over the decades, I’m fairly confident in suggesting the great advancements in the art have come from a desire to be objective. Those old effort marks I received years ago were all unsubstantiated subjective opinions and any model that relies solely on the personal (albeit) professional opinion of a teacher is bound to be contentious. 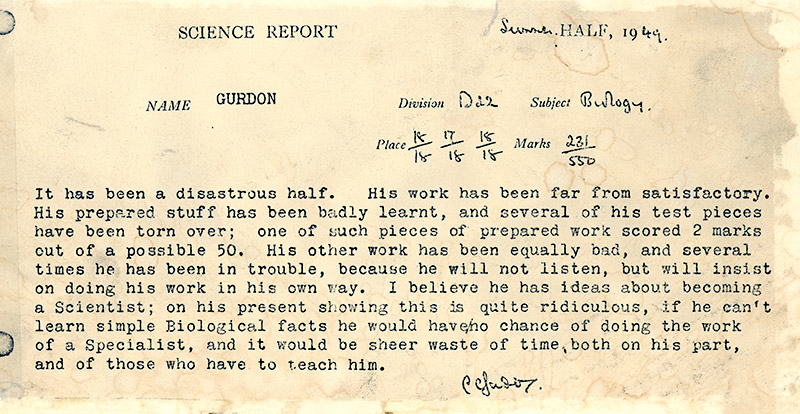 Long before Nobel laureate John Gurton’s report card (see below) highlighted the problem, I’m sure critics argued, “So what does it matter if the teacher saw the class all the time and is in a good position to judge? Are all teachers consistent and accurate in the criteria they apply? Is the process transparent? So, these days you will find some reference to effort in some school report models (actually my children attend a primary school that has a five point grading scheme for their effort) but they are unsubstantiated and appear vague and disconnected from the rest of the information. For the entirety of my professional career in high schools analysis of students’ efforts have always steered clear of the written public record and largely rested in the domain of spoken feedback. It’s a shame because I can think of enormous benefits from being able to have meaningful discussions with students and parents if only effort was more legitimately measured. For a start it would be nice to give genuine credit to conscientious, hard working middle achievers, who always seem to miss out on positive affirmation. Secondly, I can see it as a great starting point for discussions with disengaged students. From here we could move more quickly towards looking at the underlying causes for their lack of motivation and hopefully find resolutions. Mostly though, I just like the idea that we paint a more complete picture of what schools set out to achieve and what society hopes for; young people who take on life with authenticity and integrity. That’s not asking for too much is it? Actually, I don’t think it is because I consider the issue as completely redeemable. I think we are manifestly capable of measuring student effort with a high degree of accuracy and, ironically, this shouldn’t be hard. Schools already have most of the information. First, they have the aforementioned achievement history of each student. They also have mountains of background information on each of their students. Add to this the records kept on attendance, extra curricular participation, behavior, punctuality, and even attire. Oh, and then there are the teachers. Yes! Teacher opinion! Qualified, professional opinion! I don’t want to be too prescriptive about how all this data would combine to establish an effort rating. In truth I suspect some indicators would tell the story more than others depending on the students or schools concerned. Nevertheless, I have no doubt it can be used to substantiate accurate pronouncements on student effort. If schools care about their students “not giving it 110%” (sigh) they should be encouraged to substantiate and quantify this better. Nobel Laureate Gurdon’s science teacher tells it as he sees it…considered and utterly subjective. This entry was posted in Education, Professional, Teaching and tagged #WPLongform, education, effort, Opinion, personal development, study, teaching and learning by sterlinghurley. Bookmark the permalink.